The photographs of Carlos and Jason Sanchez are the outcome of meticulously staged scenes involving family and friends. Often imbued with an eeriness, a cinematic sense of suspense, and a sensationalism redolent of photojournalism, their images convey psychological distress and contemporary anxiety. This exhibition presents a significant sampling of their recent work. Natural Selection (2005); Rescue Effort (2006); Crematorium (2006); Hurried Child (2005) and 2 new images that are still in production. 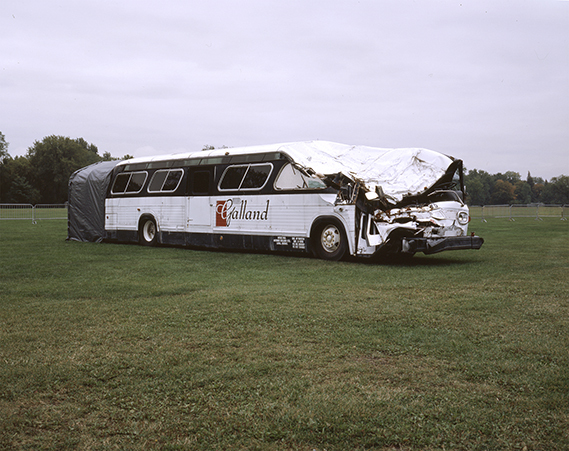 Between Life and Death (2006) is an outdoor work consisting of a damaged bus, in which the experience of death is projected in three dimensions. The holographic technology employed in this installation produces a gripping realistic effect that brings us very close to the disturbing experience. Based on accounts of near-death experiences, the project attempts to create a unadorned representation of a sacred moment where life and death come so close together. Since the beginning of the 2000’s, Carlos and Jason Sanchez have developed a powerful photographic corpus of work that is both unsettling and romantic. Their photographs freeze single, enigmatic moments from broader narratives that are never fully specified, even when they are alluded to in the titles. In the 2004 piece, Abduction, for example, we see a young girl sitting on a wrought-iron bed pretending to study a gift card. But her gaze is actually averted from a man confronting her from a kneeling position a few feet away. There is an enigmatic tension between these two, one that becomes most troubling once we know the title of the piece. In this work, as in all Sanchez pieces, the content is entirely staged. The quality of the hand-built sets, together with the studied eeriness of the lighting and the occasional use of special effects, transforms the artists’ oversized photographs into intricate film productions. Each work takes months to produce and points toward unknown narratives that viewers are invited to re-populate with their own stories. The disruptive quality of these narratives makes viewers reflect on the alleged “safeness” of contemporary society. In the 2003 work Descent, the figure of a drowning woman limply descends backwards to the bottom of a body of water. The lighting is very dramatic – a single flash located above the figure – while the broad expense of enveloping blue-black water is emotionally unsettling. The ambiguity of the composition begs viewers to invent a story that might explain the image.